Winner of Best UK Film at Sundance 2018! Come on Sunday at 8 pm instead if you want to meet director Lauren Mackenzie in person for a Q&A. Power can be ruthless, absolute, and at times invisible. Jack, a fostered boy on the run for attempted murder, seeks refuge in the house of an old deaf man who he can easily threaten to keep quiet. The more Jack’s past is revealed, through a series of flashbacks, the more apparent it becomes that he is just a boy hiding behind a facade that can crack all too easily. Meanwhile a more malicious side to the old man begins to show. Perhaps he too, is not all that he appears to be. 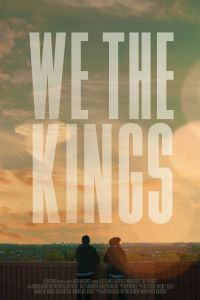 Shot in striking blue-greens in the setting of a murky house, WE THE KINGS is a portrait of two tortured souls - played by Elliot James Langridge and Timothy West with electrifying intensity. It is a study of what it means to tear down human dignity, to cover up in hiding, and to preserve and lose power.